If you want to be healed, and especially if you want God to use you to heal others, this book, Doing Healing, is a must-read! Trillions of dollars are spent annually in the health industry in our daily battle with sickness. 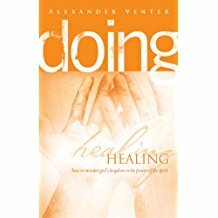 In Doing Healing, Alexander Venter give us an awesome vision of God’s healing power by addressing the questions of how we understand sickness and healing – both generally and from a Biblical viewpoint – and how our worldview affects this understanding, how Jesus healed people, and how he authorized and empowered the church to practice his healing ministry. The second half of the book, Doing Healing, gives practical part of healing ministry in six dimensions of human person hood (each a chapter): spiritual healing, psycho-emotional healing from trauma and past hurts, deliverance from spiritual powers, physical healing, healing of relationships, and healing of death and dying. The last chapter is on how to discern spiritual manifestations and authentic healing.